Twitter user believes pop star, Wizkid is greater than the late Afrobeat legend, Fela Anikulapo who is known across the world. According to @mazedamouth he would prefer to listen to the contemporary tune of Wizkid's songs than Fela's whom he believed wasn't good enough and simply over hyped in his time. "I’d rather listen to Wizkid than Fela. Maybe I’m an unsophisticated brute, but at least I’m not going to be driven to near-suicide by the grating, tone deaf singing of a fake deep hack who coasts on the power of the background instrumentals. Some are enraptured by the man’s charm & charisma. His fierce and unyielding resistance to power. But this is no substitute for talent. We are very prone to confusing history with excellence. The past with greatness. But we must wake from this lulled deceitful existence." She has ruled the catwalk ever since she began modelling aged 15. And Naomi Campbell took some well deserved time out from her hectic schedule as she enjoyed a boat ride during a family getaway to Kenya, Africa, earlier this week on Thursday. The supermodel, 48, looked incredible as she showcased her toned physique in a tiny black and yellow striped triangle bikini for the fun excursion. Adding a glamorous twist to her swimwear look, Naomi added a collection of gold necklaces, a stylish body chain, diamond earrings and a pair of oversized black sunglasses. The model legend looked every inch the holiday babe as she ditched her make-up to soak up the sun and wore a black hair wrap. The model is currently travelling Africa, mixing work with pleasure, spending the start of her getaway and Christmas in Kenya and moving onto Ghana. 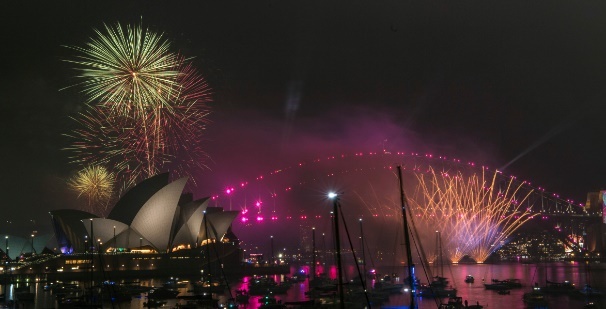 Australia and New Zealand have both welcomed the arrival of 2019 in fine style with displays of fireworks watched by millions of people. Brits still have hours to wait until festivities begin, but millions of people Down Under are already celebrating the arrival of the new year after clocks ticked past midnight. Revellers celebrated in Sydney and in Auckland, New Zealand. Among the first to bring in the New Year were people in Samoa. It became 2019 there at around 10am UK time. But thousands of people waiting to watch the New Year’s Eve fireworks around Sydney harbour were battered by torrential rain as a thunderstorm swept the city hours before midnight. The New Year's firework display from the Sky Tower in Auckland, New Zealand, was among the first displays at a major city marking the beginning of 2019. Usher has been pictured for the first time since officially filing for divorce from wife Grace Miguel, 49. The Yeah hitmaker, 40, was already separated from his wife as of early 2018, but filed for divorce in Georgia on Friday, according to The Blast. And now, the R&B singer was spotted looking in jovial spirits as he stepped out in West Hollywood on Sunday. The music maker looked stylish in a pair of khaki-coloured joggers which he teamed with an oversized black hoodie and complementing trench coat. Usher was pictured sporting a short black brace on his left foot while his other was dressed in a brown suede military-inspired boot. Despite his apparent injury, Usher smiled as he strolled along the pavement and displayed his braided hair. His appearance comes days after he officially filed for divorce from his wife Grace. 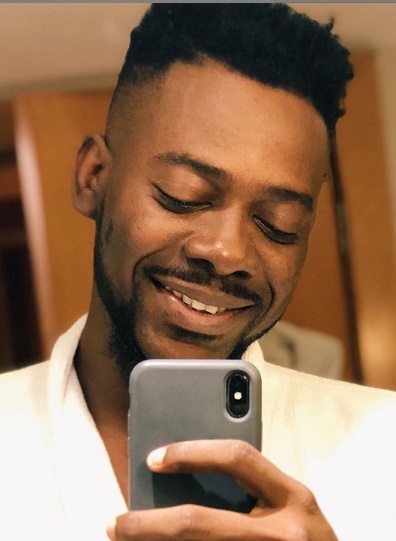 Singer Adekunle Gold has taken to his IG page to celebrate his dad, Adeyemi Kosoko who was appointed Permanent Secretary for Education in Lagos by Governor Akinwunmi Ambode. Growing up, I watched my dad worked so hard for too little. Teachers weren’t big earners. But my dad, with the help of my mum, provided everything all 4 of us needed - maybe not wanted, but definitely needed. I remember when my dad went to Uniben for his first degree. My sisters and I were very young, and communication with him was pretty much impossible, because it was before the era of cellphones. We only saw him when he had school breaks. He finished as the best in his class with a distinction in Fine Arts, Painting & Graphics Major. He was part of the team that co-wrote the module for teachers at one time. Everyday, after his primary assignment as a Fine Arts teacher in Keke High School, he would go to Teachers’ College to teach other teachers. He was willing to do whatever it would take to make extra money to fend for us and build a house for us to live in. I almost forgot - he is a published writer. Brilliant Man! My dad didn’t literally sit me down to teach me great values and diligence. Luckily, he didn’t have to, because I saw it in him everyday. He has given so much of himself, and truly values the opportunity to be serving the government and every school he’s worked at as either teacher, VP or principal. He’s won about 30 awards for his selfless service to the state.My Dad. A Man! Hard as it might be to believe, I can honestly say I’ve never seen him disobey traffic rules or give bribe. my dad said no. 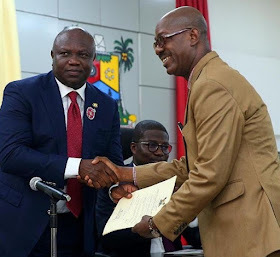 He said - “I have been in service for far too long to let quick money ruin my reputation.” His dream has always been to become a Permanent Secretary of Lagos state. It was his dream, it was also mine for him. In this moment, this 56 year old brilliant man’s dream is now his reality. Today, I sat in the audience, and I listened as they read out loud, his achievements. I watched as he was sworn in as a Tutor General/Permanent Secretary for Education. So I cried today, but they were happy tears. 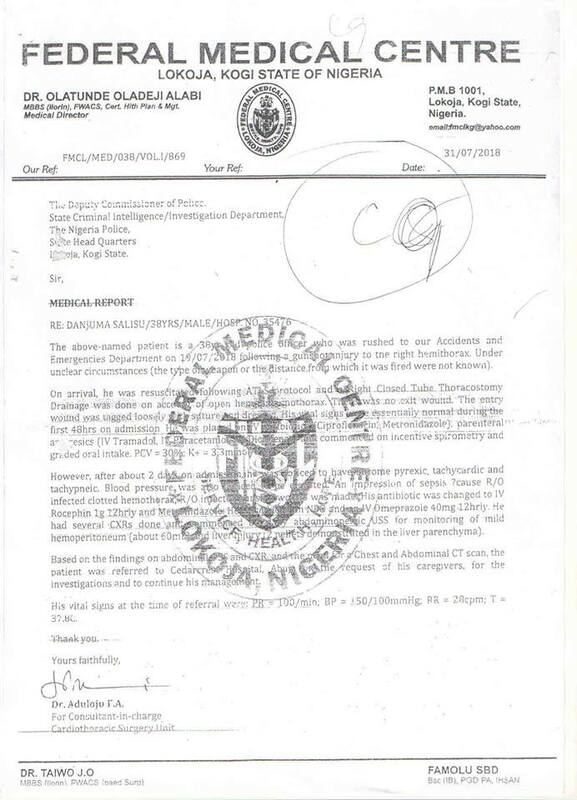 A young man identified only as Adama killed his father and also wounded his brother over a plate of soup. According to media reports, the shocking incident happened on Saturday at Kyinya, in the Kintampo North Municipality of the Brong Ahafo Region, Ghana. An elder son of the deceased, one Gafaru told journalists that his younger brother, the suspect is noted for a deviant behavior and had persistently been threatening members of the family until his latest action. He confirmed that there was an exchange of words between Adama and Nechema while his father tried to calm them because of a misunderstanding over a bowl of soup. Gafaru explained that the soup was prepared by Nachema, his brother who survived the gunshot and still responding to treatment at the Kintampo Hospital. According to him, Adama came home that evening in an anticipation of feasting with the soup only to realise that Nachema had finished it. That, according to Gafaru provoked Adama who ranted and knocked down any available thing. 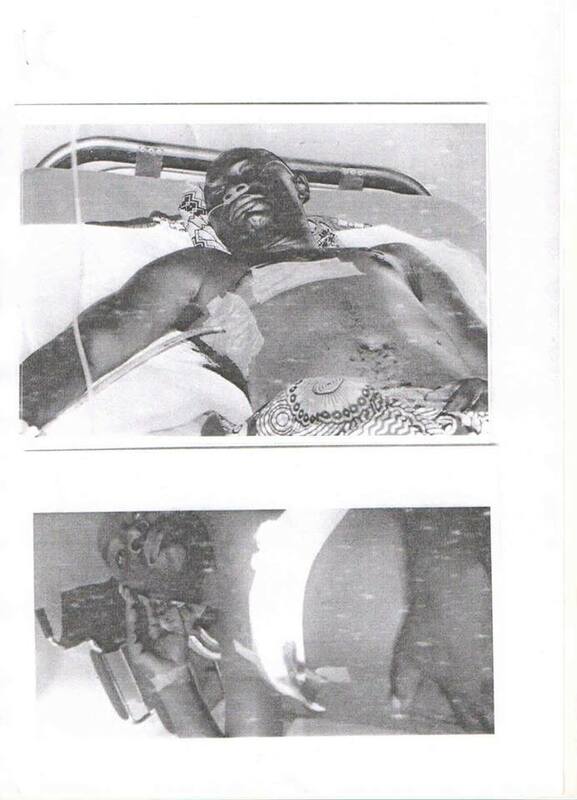 Gafaru said Adama finally picked a gun and shot the father and the brother sporadically which resulted in the death of the father while the brother received several bullet wounds on his buttocks. The Kintampo police have confirmed the arrest of the suspect and said investigations are underway. If you really want to have a good and happy home, then read this important piece about the type of men you must avoid in marriage. Here is an advisory published by Agnes Sikuku for would-be-wives, on men they should avoid in forging relationships.We find the advisory interesting. We hope ladies will also find it useful. The reason you shouldn’t marry them is obvious; they will not talk about anything else apart from their mama. You will be faced with a hard time making important decisions. Mama has to be called and asked her views on things that don’t concern her. This man has more than three baby mamas. He has not married any of them. He tells you how all the baby mamas had faults here and there. Like an airhead you are, you swallow the bait. You believe you are the best of them all. That those baby mamas had weaknesses but you are different. Breaking news! You are not any different. The sky will come falling. Why a woman marries a man who hits her is a mystery to me. A woman’s bruises, black eye and dents on her body are countless, yet she affords a feeble “but I love him, he will change”. 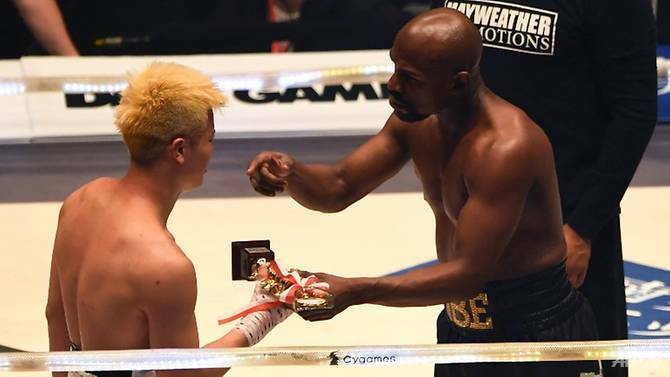 Why this Mike Tysons can’t be gathered and forced to represent our country in boxing, is being lenient. I think the government knows they will be beaten to pulp or even be killed in the ring. Trust me, they are cowards and weak. The government is protecting them. A man, whose love for other women surpasses his love for you, should not be married. He can’t be faithful or even try. He will prick your esteem with his ways. You will always imagine you are not good enough. Sometimes, you will even fight with other women in the name of fighting for your marriage. It’s a gloomy picture. Never say yes to such a loser. Some men are jobless and have no steady source of income. Some have education but blame the government for their unemployment. We understand all this. It’s only fair that a man does everything possible to get a job. A jobless man who sleeps on the couch all day and wonders how he can get a job shouldn’t be married. He is just poor and lazy to be taken seriously for marriage. She's the hottest female rapper in the game, with her latest music video for her song Money racking up 21 million views on YouTube in just one week. And on Sunday, Cardi B proved why she's the biggest name in hip hop, as she stunned fans at the Origin Fields Festival in Perth, Australia. The 26-year-old thrilled the 36,000-strong crowed as she performed her hit songs and showcased her impressive twerking skills. Cardi left little to the imagination in a sheer red bodysuit, which revealed her matching coloured underwear. The NYC-born hitmaker was dressed to impress as she slipped her curves into the extravagant ensemble which showed off her famous figure. The sequinned number boasted a short hemline, which revealed her toned legs in a pair of leather boots. Cardi stuck to the colour scheme by wearing a flowing red wig with black tips. She was joined on stage by an entourage of back-up dancers, who each wore gold ensembles paired with matching heels. 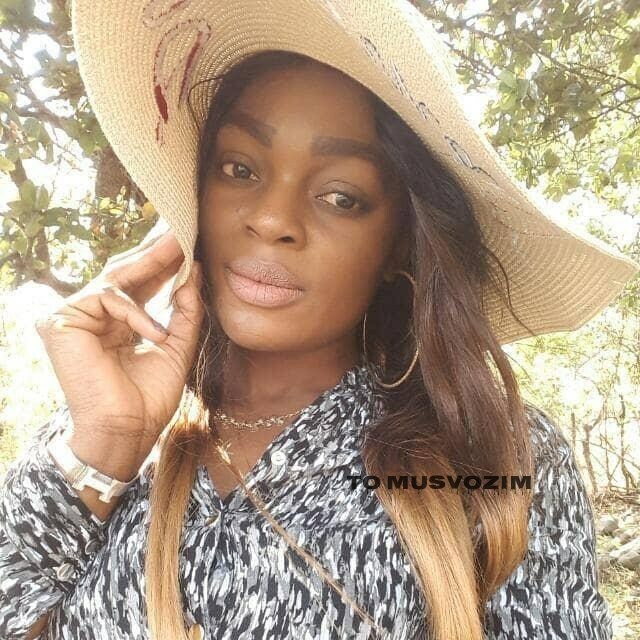 Homicide detectives in Mutare, Zimbabwe are looking for a Chikanga woman who disappeared soon after axing her husband to death following a domestic dispute on December 24. The chilling incident, which shocked many in the suburb, was sparked by gifts which the couple had bought for their child for Christmas. Anesu Mafokosho is alleged to have axed Vitalis Mudhumo (26) at around 3pm soon after the couple returned home from the city centre where they had gone shopping. The couple, whose union was on the rocks, had an unresolved marital dispute that was threatening the marriage. 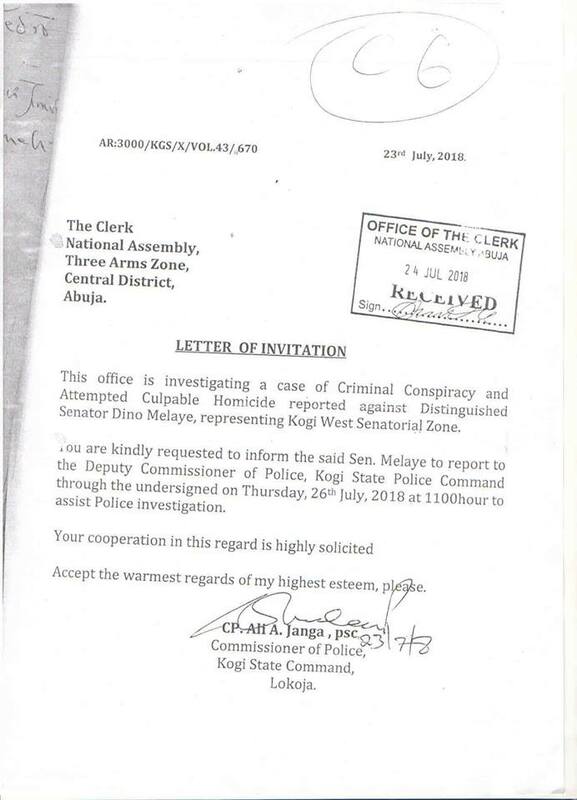 Circumstances to the case are that on December 24 the now deceased met the accused person at the Stop Sign in Chikanga 2. The two drove to Edgars Mutare where they bought their three-year-old daughter’s clothes. After shopping, the deceased and his wife went back home. On arrival at home, the accused person’s young sister was at home in the dining room. She heard the couple arguing outside the yard for about 45 minutes. Moments later they got into the house and entered into their bedroom. 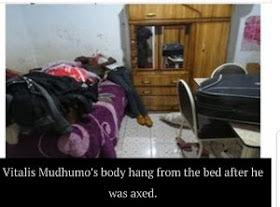 All hell broke loose in the bedroom after the deceased started packing his clothes saying he was moving out. His wife begged him to change his mind. 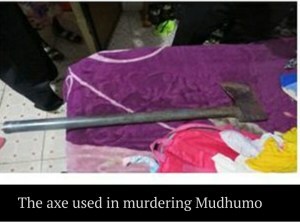 The situation degenerated into chaos resulting in the accused person axing the deceased three time on the neck. Soon after committing the offence, Mafokosho left the house but she had already texted a message to her younger sister advising her to see what she had done in the bedroom. The sister went into the bedroom only to find the now deceased bleeding profusely and convulsing on the bed. 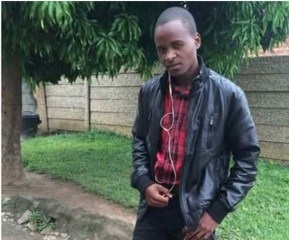 Manicaland police spokesman Inspector Tavhiringwa Kakohwa said Mudhumo’s body was taken to Mutare Provincial Hospital for post mortem. The accused is still at large and investigations are in progress. 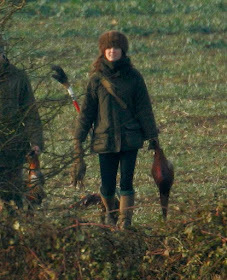 The Duchess of Cambridge went out shooting the day after her animal-loving sister-in-law left Sandringham. 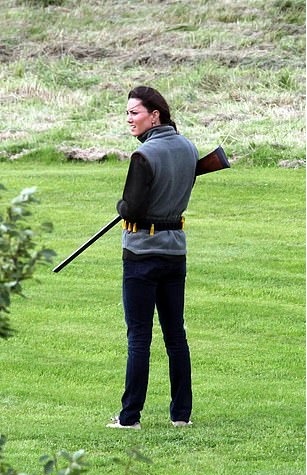 Kate, 36, has become a keen markswoman – and has even invested in her own shotgun, sources say. Royal sources had categorically denied the duchess had made any effort to bar Harry. 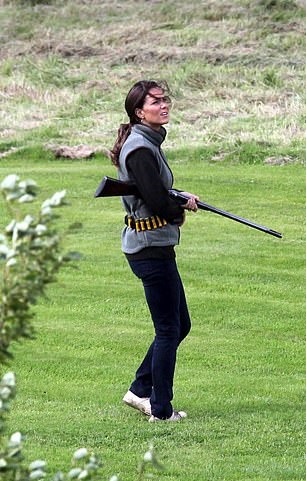 A royal insider said that the duchess has bought a 20-bore shotgun, which is much lighter and easier to use than the usual 12-bore. The source said: 'She frequently goes out shooting when she is staying at Anmer Hall [the Cambridges' country home at Sandringham] and has become a really good shot. Three people were killed and another 79 were unaccounted for after a gas explosion rocked a residential building in Russia today, leaving hundreds without a home in freezing temperatures on New Year's Eve. An entire section of the 12-storey residential building collapsed when a gas explosion tore through the high-rise in the industrial city of Magnitogorsk nearly 1,700 kilometres (1,050 miles) east of Moscow in the Ural mountains. "Three people have been pulled alive from the rubble and three are dead," Boris Dubrovsky, governor of the Chelyabinsk region where the city is located, said in a statement. 2019 is the time for you to glow sis. You are going to shine so brightly that all your enemies will be confused. So we’re sharing a few handy tips that will help you achieve this blinding glow. Soak a towel in hot water and place the towel over your face for several minutes until it cools. Do this first thing in the morning before washing your face to help open your pores. Buy a cleanser that contains glycerin and won’t strip away your skin’s protective oils. Other ingredients you can use include essential oils, coconut, aloe vera, chamomile and oats. Apply a natural toner made from lemon juice and water. Fill a container with one part freshly squeezed lemon juice and five parts filtered water. Apply the lemon juice toner with a cotton ball and do not rinse off. Massage your face with oils like sweet almond, coconut, olive and jojoba before going to bed. Allowing oils to soak into the skin overnight can contribute to glowing skin in the morning. Apply the oil to the skin using your fingertips. Apply a homemade, natural face mask once or twice per week. Mash one ripe banana with one egg white and coat your face, neck and decolletage with the mixture. Leave the mask on for 15 minutes, then rinse it off with warm water. Help your skin develop a glow by consuming a diet rich in a variety of fruits and vegetables. Also drink at least eight 8-ounce glasses of water daily to keep your skin hydrated. 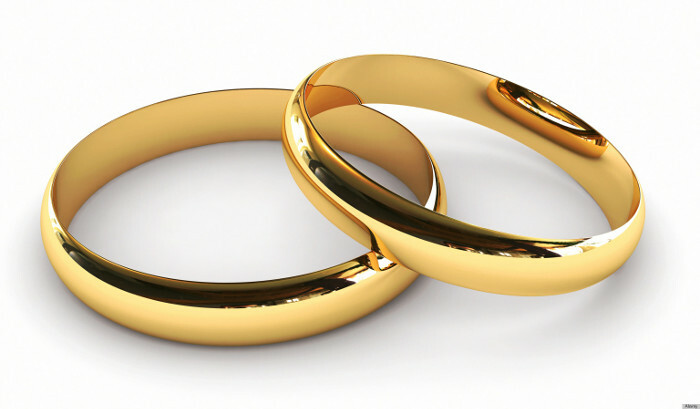 Dennis Kinyanjui and Agnes Wangari were determined to cross the year as husband and wife, so they invited their families and friends to witness their union at the ACK Jehovah Shammah Prayer Centre in Pipeline, Nakuru town, yesterday. However, a pregnant woman who claimed David was her husband, would stop nothing to ruin the ceremony, even forgetting her condition for a moment to scale up the locked church gate. Well, the bride and groom managed to exchange the vows but had to be whisked away immediately after to escape the wrath of a woman scorned. As the church gate announced, it seemed the Lord was indeed there. It’s a few days to the end of 2018, but who says you have to end it single? So you’ve been trying all year to clinch the man of your dreams, and it just hasn’t happened. In fact, you’re scared of going home for Christmas because you know you’re going to get the ‘So are you with anybody yet’ question. Your sisters and cousins are going to visit with their handsome and accomplished men, and you’re on the verge of renting a man just so you don’t have to be the ‘forever single’ person for the 5th year in a row. Going out? Make sure you’re in a killer outfit with amazing heels and the best makeup. Remember to look irresistible. When you’re looking and feeling your best, guys will sense that confidence and be instantly attracted. Nothing is more attractive than a confident woman. Remember that you are amazing and beautiful, and you are the best thing that could happen to any man. Imprint yourself in the guy’s mind by being great to talk to. Get him talking about something he loves. When a guy’s talking about something he’s really into, he’ll get excited and associate those feel-good vibes with you. Wear the best perfume you have. Scent is the sense that’s most closely tied to memory, if you smell sweet, he’ll associate that sweetness with you as he thinks about you later. Flirt, but not too seriously. You want to make it clear you’re interested while letting him know he’s still got some work to do to get you. Graze his arm lightly as you’re talking. Skin-to-skin contact sparks the release of oxytocin, the feel-good hormone, that will make him instantly feel more focused on you. When you go on dates, make sure you pay for some stuff. This will show him that you’re not a broke girl who is after his money. Be busy sometimes. Don’t always text back right away, and make plans to go out with your girlfriends every few Fridays. Seeing how in-demand you are tells him he’s competing with others for a spot in your life.